Leveraging on the support of sedulous workforce, we are able to manufacture and supply a wide range of Top Driven Bottom Discharge Centrifuge Machines. For the convenience of our reputed patrons, we provide these machines in various specifications and as per the details given by patrons. We make personal interactions with patrons to understand their requirement. Later by using optimum quality raw material and other components, we manufacture these machines accordingly. 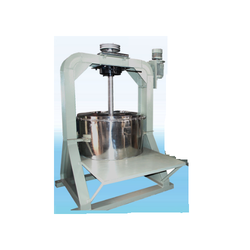 We are comprehensively offering a wide range of Top Driven Bottom Discharge Centrifuge Machines. These bottom discharge centrifuge machines are highly acknowledged in the market, owing to their speedy operations, low maintenance, and longer service life. In addition to this, strict testing measures are implemented on these centrifuge machines by our proficient quality controllers. They ensure to check the entire range of offered bottom discharge centrifuge machines on its performance and sturdiness, thus delivering defect free products at clients' premises. These machines are suitable for chemical industries where solid – liquid separation is required. Looking for Top Driven Bottom Discharge Centrifuge Machines ?